The Gingerbread Base is only available during Great Winter Hunt events. This base has been baked in the oven for just the right amount of time to make it a lightly toasted, chewy wonder. After taking it out of the oven, Santa's elves dusted the base with a sprinkling of powdered sugar and then decorated it with a festive star pattern and multi-colored gumdrops. Unfortunately, they also left it out on the counter where the mice could walk all over it. Now that it's unsuitable to give as a gift, you might as well put a trap on top of it. The Gingerbread Base is available only during the annual Great Winter Hunt event. When first released in 2009, the Gingerbread Base could only be crafted given the proper ingredients. Hunters with the proper ingredients may still craft this base. 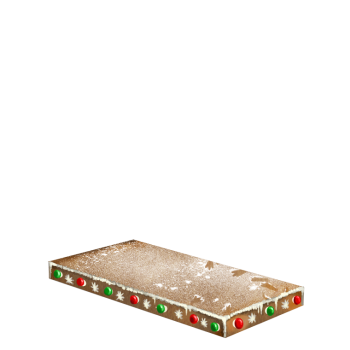 Candy Cane Base - Available only during Great Winter Hunt events. Festive Winter Hunt Base - Available only during Great Winter Hunt events. A complete list of All Bases can be found here. 9 December 2009: The Gingerbread Base was introduced when hunters found that Gingerbread Base Blueprints were being dropped by the Ornament Mouse in the Festive Comet right after the Gingerbread House Surprise was released. Soon after the blueprints were released, the Christmas Tree Mouse also started dropping both the Gingerbread Base Blueprints and Gingerbread House Plans. 7 December 2011: During the Great Winter Hunt 2011, the Festive Comet Trapsmith sold the Gingerbread Base for the first time, at a purchase price of 27,000 gold and 30 Ice Coins, along with a minimum possession of 200 Festive Toy Receipts; the refund price was 5,400 gold. This page was last edited on 14 January 2019, at 13:33.